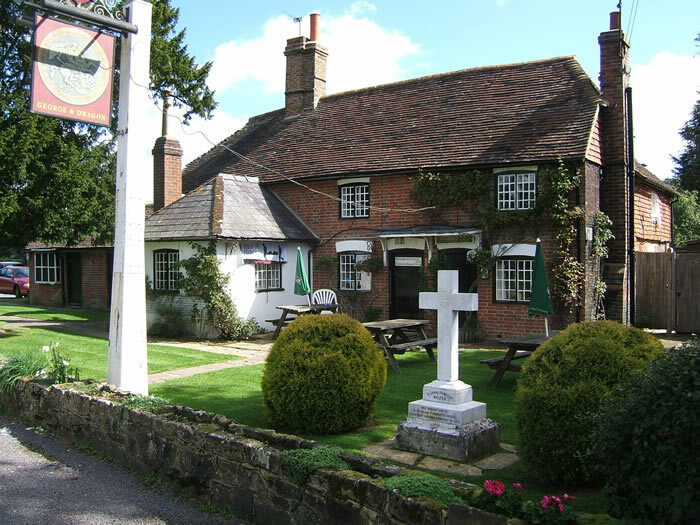 The George and Dragon is a small pub, usually decorated with flowers, in an idyllic setting on a quiet lane. There is a small flag-stoned bar inside the pub and a large, grassy garden to the rear. In 2012, the pub changed ownership/management and re-opened after refurbishment. It's now a freehouse with beers, for example Brighton Best and Hophead, from several Sussex breweries. Yay! Rather strangely, there is a gravestone, of the albino son of a former innkeeper, in the front garden. The grave is in the church but the gravestone was removed by the vicar, apparently because of the inscription, so the parents put the memorial in their pub garden. Return home via the quiet roads between the A272 - Dragons Green - Christ's Hospital - Southwater/Horsham. Visit the Bax Castle on the way!